From beach bungalow to modern mansion overlooking the sea at the Strand, a Manhattan Beach, California home remodel is the way to go. Even the Wall Street Journal has noted the trend (http://www.wsj.com/articles/californias-hot-housing-market-drives-pricey-home-facelifts-1462456812). Ready for your own home improvements? 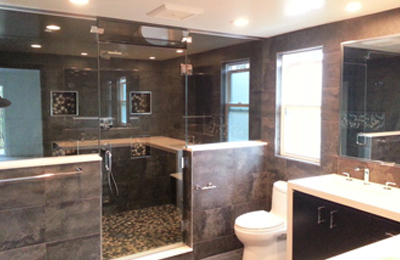 My Space has the experience and dedication to quality that it takes complete an outstanding room addition, kitchen remodel, or bathroom remodel — hassle-free and on time. Our home remodeling experts are also ready to expand your outdoor experiences with decks and gazebos, patio enclosures, and outdoor kitchens with stylish patio covers. Give us a call for a complimentary estimate and a quick follow up with design concepts and a bid. With experienced designers, superb workmanship, and only top-of-the line materials and fixtures we guarantee your satisfaction. And we’ll be happy to work with your own interior designer. Of course we’re insured and fully licensed. As a general contractor we’ll take care of everything from permits to clean up so you won’t be wasting your time dealing with multiple companies for cabinetry, electrical, plumbing, flooring, roofing, window replacement, and so on. 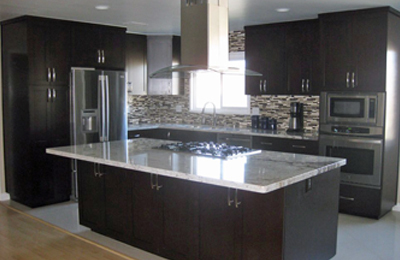 Our highly professional crews include specialists in granite, marble, kitchen cabinets, and so much more. And our experienced management pros keep everything on track. 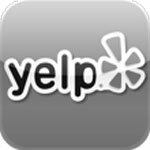 Want a referral from a prior bathroom remodel, kitchen remodel, or room addition? Just ask! The whole country has taken note of the Manhattan Beach housing market. Combine panoramic city and ocean views and oceanfront residences with a near-perfect climate and outstanding schools and you get some of the most expensive homes in the United States. And prices are continuing to climb. Zillow, Realtor.com, and Trulia report median prices of $1.6 million in 2013, $1.9 million in 2014, and $2.2 million in 2016. Mid-2016 median prices range from $918 to $1,170 per square foot, so you should only consider top-of-class remodeling and room additions! As with any city, Manhattan Beach’s formal construction permitting process provides safety and protection for you and your neighbors. Sensitive to views, there are height limitations for room additions, with zoning by district. 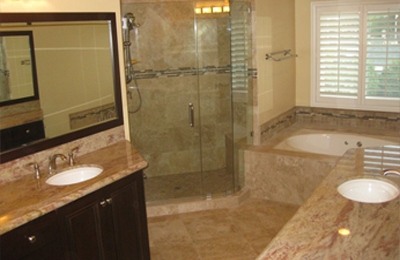 Permits are required for most kitchen remodels and bathroom remodels. And there will be separate permits for electrical, fire protection, mechanical systems, plumbing, and re-roofing. The plan check fees themselves are an expense not to be neglected, running some $800 to $1,500 for a bathroom remodel and some $1,500 to $2,500 for a kitchen remodel. You can file for permits yourself, but with so much at stake (not to mention a half-dozen or so forms and hundreds of requirements) it’s far better to let an experienced contractor take care of that. If a company tries to talk you out of filing for a permit, drop them from your list immediately — there will only be trouble later! When you need more space our room addition experts are ready for home offices, home theaters, and more. 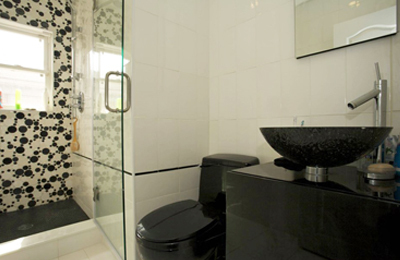 Whatever your special interests and needs might be, we can convert an existing area or add an entirely new space. That could be expanding a kitchen, or converting a bedroom into a spacious and luxurious master suite. Manhattan Beach has strict height restrictions, but where zoning permits we can make second-floor additions. You should also think about a premium patio enclosure for year-round use with plenty of natural light. Of course everything we do will match the existing structure perfectly, inside and out. One of the most popular home improvements, a bathroom remodel can range from a cozy tiled half-bath to your own private spa along with amazing designer sinks and faucets. How about a custom walk-in tile shower with seating plus a whirlpool tub offset into its own area? A heated floor is both a delight and an energy-saver. For the best bathroom remodel ever we’ll include your favorite fixtures and features, and tie everything together with gorgeous choices of materials and colors. Every home deserves a dream kitchen. So let a kitchen remodel achieve the style you want, whether that’s modern, contemporary, or retro. Why not combine modern and traditional and make it an open space you absolutely adore with plenty of natural lighting. We’ll create tile back splashes that perfectly compliment marble or granite counter tops and kitchen cabinets featuring natural wood, glass, or painted wood doors. 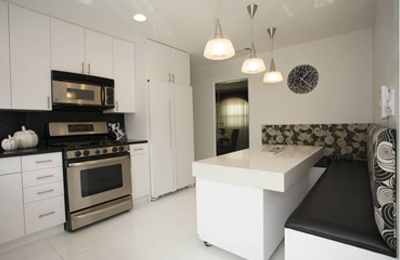 Working with you we’ll make sure that new appliances, flooring, lighting fixtures, and colors all work together and blend into adjoining living spaces. If you’re fortunate enough to have some outdoor space, you may fall in love with our decks and gazebos. 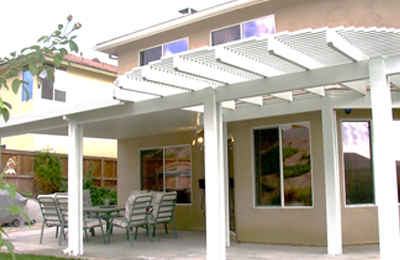 Or how about an outdoor kitchen, shaded and protected by top-quality patio cover? HGTV recommends 3 crucial steps in choosing a home improvement contractor. Seek out reputable contractors and verify their credentials. They should have established a long-term local presence, and you should confirm that they have all the required state and local licensing as well as liability and worker’s insurance. Narrow that list down to 3. Do all their contacts seem professional, and someone you would feel comfortable working with? Actually call the references they provide and ask about their experience and if they would hire that contractor again. Carefully scrutinize the bid and contract. Is everything you want specifically and fully detailed? Are there schedule milestones? Is there a waver of lien for any subcontractors? For the full details, visit http://www.hgtv.com/design/decorating/clean-and-organize/how-to-choose-a-remodeling-contractor.